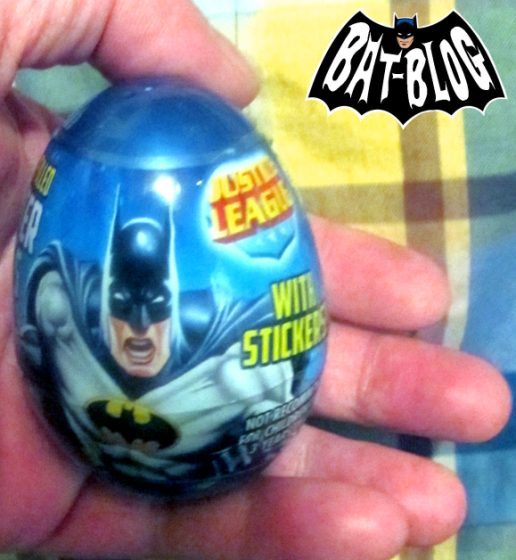 I went to my local Walgreen's Drug Store the other night and out of the corner of my eye I spotted this new treasure, a BATMAN Plastic Easter Egg that is filled with candy and comes with a sticker. I didn't open mine so I'm not sure what it looks like or even what kinda candy is inside, ha! The weird thing is that the product here has the "Justice League" logo on it... but the ONLY 2 characters they made were Batman and Superman. The cost is about 99 cents, not bad. It's kind of a fun item for display. Hey, has anyone out there seen any other weird and brand-new bat-merchandise out there? If so, then please let us know.